In Antwerp, Rubens trained under two of Antwerp’s leading painters, Adam van Noort (1561 – 1641) and Otto van Veen (1556 – 1629). He studied the woodcut works of Hans Holbein the Younger (1497 – 1543) and the engravings of Marcantonio (1480 – 1534), eventual becoming an independent master in the Guild of Saint Luke at Antwerp in 1598. Rubens would also become highly influenced by the Italian masters, traveling extensively through Italy, as well as to Spain. Upon Rubens first return to Antwerp from Spain, it proved gainful for an artist at a time of the Twelve Years Truce, through the treaty of Antwerp. He found a position as court painter for Albert, Archduke of Austria and his wife, Isabella; his house and studio in Antwerp is now the Rubenshuis Museum. In his workshop, paintings can be divided into three categories: those painted by Rubens himself, those which he painted in part (mainly hands and faces), and those he only supervised. He had, as was usual at the time, a large workshop with many apprentices and students, some of whom, such as Anthony Van Dyck (1599 – 1641), became famous in their own right. He also often sub-contracted elements such as animals or still-life in large compositions to specialists such as Jacob Jordaens (1593 – 1678). Rubens also collaborated with painters such as the animal specialist Frans Snyders (1579 – 1657), who assisted Rubens with his, Prometheus Bound, in 1612, as well as with Jan Brueghel the Elder (1568 – 1625), who painted floral in a number of Rubens works such as, Satyr viewing the Sleeping Nymph. 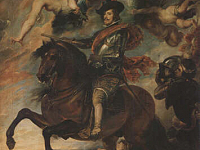 The work in the Uffizi Gallery attributed to the School of Peter Paul Rubens, is Philip IV of Spain on Horseback. Rubens himself had a strong bond to Philip IV of Spain (1605 – 1665), a relationship that was both diplomatic and artistic, and Philip IV (as King of Spain) knighted Rubens in 1624. Under the court of Philip IV, Rubens befriended his court painter, Diego Velázquez (1599 – 1660).